*Trippier is a cheaper version of Clyne & has better upcoming games. Why have I bought Trippier? 2nd highest outfield FPL points scorer for Burnley this season. Good run of games: NEW (A), QPR (H), CRY (H), SUN (A), WBA (H). Prowess: Apparently made 19 assists in the Championship last season. I think he is under-the-radar and in many respects a "Moneyball" buy! Swansea have one of the worst away records in the PL this season. They have conceded on average 1.78 goals per away game. Austin hasn't blanked 2 weeks in a row at home since 19th Oct.
QPR want to avoid a relegation dog fight & seem to only win at home. Austin has the highest number of shots on target at home in 14/15. Can you outdo me on their game-by-game platform? Feel free to sign up and try to beat me next time? It’s the new year, the new you. You are going to be brave and seize opportunity when it appears at your door. There’s a wildcard upon us and your feeling brave with your last few transfers before your squad gets revamped for the second half of the battle. This week we look to one of the FPLs most coveted strikers but injury has seen his selection diminish over the last few months. Benteke currently is owned by just 2.1% of the game. That has risen by 1.0% over the past week and with two strong fixtures ahead with managerless Crystal Palace visiting Villa Park followed by a trip to the King Power in game week 21 to face Leicester. Villa will need some points from these fixtures and will hope to capitalise on a Palace side awaiting the appointment of Pardew who may of taken their eye off the ball for a week under the stewardship of Keith Millen who has had mixed results in his brief managerial tenures. Benteke on his day is more than a handful for the best defences in the league so if he can turn it on he can definitely be in the points in this game. Benteke would of gained some ownership from the Giroud red card owners and the recent uncertainty over Wilfried Bony’s starting place may have gained him some further ownership. Is Costa worth 11m with Spurs away and bogey side Newcastle in their next two matches? Here lies an interesting alternative. 7 gameweeks have passed by. Over 200 entrants have fallen. You can be a king one week and a pauper the next - that's the beauty of #BattleRoyal2 (also known as #WinterWorldCup2014). You can't fluke it and win, you need to be consistent. The grand final takes places on Gameweek 20. There can only be ONE winner. Prospects for the Final: Improved after each round and a rising star. Prospects for the Final: Reasonable Contender. Prospects for the Final: Outside chance, but has form on side. Prospects for the Final: Experienced FPL player & a favourite to win. Prospects for the Final: Highest overall ranked player by far & a favourite to win. Prospects for the Final: Dark horse and a potential favourite to win. A special thanks to @FPLDaily for making this competition work so well through his sheer effort, grit, time and top coding skills! Radamel Falcao’s assist returned the maverick to scoring success and a quick turnaround for game week 19 sees us travel across Manchester to last season’s champions Manchester City for the midfield dynamo and once Man United target Samir Nasri as this weeks selection. City’s lack of a recognised striker has pushed the emphasis onto the midfield to get forward and produce. James Milner has currently been occupying the false no.9 position but with Stevan Jovetic rumoured to be pushing for a start the division of 90 minutes in that role between the two looks all but assured, David Silva’s last two performances have been nothing short of brilliant and have handed many a fantasy manager a leg up to a better position, his returns have been great but has failed to complete more than 70 minutes in those last two outings. Samir Nasri could be the diamond in the rough here though. Owned by 2.4% of the population Nasri has all but completed the last three full games albeit being withdrawn in the last match on 74 with this match against Burnley in mind i’m sure. Having only achieved one assist in those last four matches maybe alarming for some but maybe he could be ready to hit the jackpot as others move for the more widely owned Eriksen and Sterling. After Burnley the Champions then face struggling Sunderland at the Etihad and a trip to Goodison completes the next three before games against Arsenal and Chelsea and the likely exit via the wildcard could be a viable strategy. To sum up Eriksen, Sterling and the likes of Siggurdson and Downing could be described as safer picks but this is the maverick! If ever there was a fixture to take a gamble this probably would be it! *Giroud was a spectacular fail & Benteke is a viable replacement. Why have I bought Benteke? Benteke has viable fantasy returns in his last 2 home games. Has registered 4 shots on target at home in his last 2 home games. Benteke's home ALI (potency) is higher than Austin's since GW15. Has a pedigree of scoring in the PL. I think he is due to score more. Why did I captain Austin? Joint top goalscorer at home in the PL this season (9). Joint best "fantasy returns at home of any player in the PL (7). Most shots on target at home of any player in the PL (20). Best player for shots on target at home since GW 16 (6). QPR (17) have scored more goals at home than Man City (15). Palace are manager-less and concede 1.78 goals when away in 14/15. Raheem Sterling – The winger was monotonous in the opening half in an unfamiliar role, yet scored the winning goal by rounding the goalkeeper using his pace. Diego Costa – The powerhouse forward assisted John Terry with a flick of his head, and then went on arrowing a grounder that sealed a comfortable 2-0 triumph over West Ham United. Wayne Rooney – The magician of the red half of Manchester clinched a well-taken brace for himself plus assisted Robin Van Persie for the third goal of the day. Harry Kane – The dazzling wonder-kid of White Hart Lane opened the scoring at The King Stadium within two minutes of play with a nifty first touch and lashing his strike into the net. Nikica Jelavic – The former Evertonian fired Hull City’s third goal against The Black Cats with a composed finish. 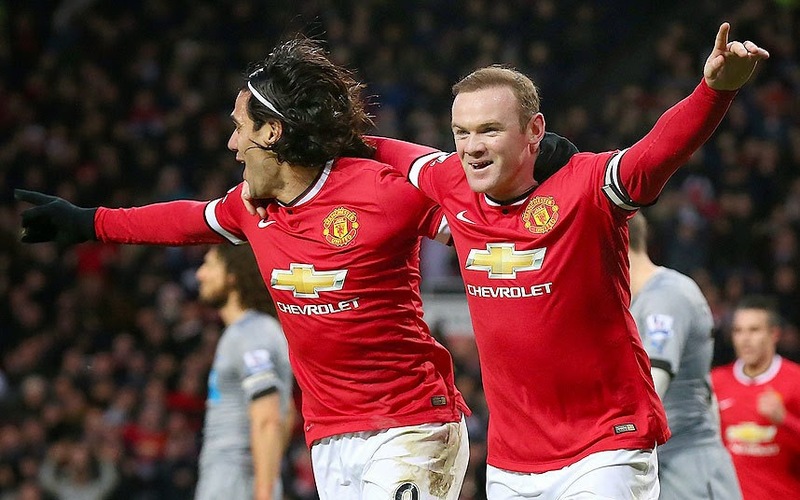 Radamel Falcao – The Colombian star contributed with a phenomenal assist to Wayne Rooney for the first goal at Old Trafford against Newcastle United. Charlie Austin – The prodigious forward scored his 12th goal of the season against The Gunners! David Silva – The Spain international is on rampage form, netting his fourth goal out of six matches at The Hawtorns. Philippe Coutinho – The Brazilian produced the classiest moment of the match when his magnificent flick pass found Raheem Steerling who put the ball into the back of the net. Gylfi Sigurdsson – The Iceland playmaker whipped in a spectacular free-kick that had Brad Guzan no chance of saving. A goal worth watching numerous times! Gaston Ramirez – The underrated midfielder long strike goal started off Hull City’s much needed comeback victory against Sunderland. Christian Eriksen – The former Ajax star once again rescued his side with the winning goal in the 72th minute of the match. Tomas Rosicky – His Premier League start of the season and he contributed with the winning goal of the game. Alexis Sanchez – The Chilean winger amended his penalty miss with a header opener and assisted Rosicky for the second goal. Bojan Krkic – The former Barcelona starlet won and converted a controversial spot kick in style at Goodison Park. Mamadou Sakho – The Frenchman’s return to Liverpool’s starting lineup is fantastic. He was robust and organized at the back with 100% tackles won. Mathieu Debuchy – He was dominant at the back with numerous attacking bursts, whereas was unlucky for conceding the penalty as he clearly got the ball. John Terry – Chelsea’s leader finished his second goal of the season from close range in the opening minutes at Stamford Bridge. Ryan Bertrand - A thunderous shot from the former Chelsea full-back for the second goal for The Saints. Toby Alderweireld – The Belgian center back’s strong header found the back of the net from a resulting corner kick. Lukasz Fabianski – The Poland international was resilient at the back, clinching his 8th clean sheet of the season. Strong contender for the fantasy premier league! Thibaut Courtois – The big Belgian has a relaxed afternoon, The Blues 7th clean sheet this season. I don't usually do any write ups in the immediate aftermath of a Gameweek. But I feel that I have done 10 rounds of boxing, aptly on Boxing Day, and have been unexpectedly bruised. As a result, a write up is in order as I know lots of people follow FPLH enthusiastically and even make decisions based on what my writers and I say. What I considered masterstroke team selections and shrewd transfers for GW18 backfired in spectacular fashion. This is in stark contrast to the recent FPL captain highs that I have experienced. So how bad was the damage? I have crashed out of the FPL cup in the first round (first time this has happened). = -31 points net loss (without factoring in alternative captain options*). *I could have captained Silva, Siggy, Chadli, Costa, Hazard or even Green for some viable fantasy returns, but I gave the armband to Giroud and he gave us a moment of madness. A lot of what has happened in GW18 was a culmination of freakish outcomes. I don't claim to predict the future and never will. But I rely on statistical analysis and calculated risks to make my FPL decisions. The irony was that I didn't even consider buying Giroud till late on, but I felt he was viable as a one GW transfer (then to be replaced by Benteke). Sadly it wasn't in my destiny to do that well during this Gameweek. I can let it hinder my strategy or move on. C'est la vie. Let me be clear, I play FPL as I enjoy the game and like helping others with the hints that I provide. Please note, anyone who takes my advice on board does so on their own accord - ultimately, you make your own FPL decisions. I have no regrets on the changes I made, as I based it on sound logic which had put me in good stead in the previous Gameweeks. I will continue to use statistical analysis to buy players & select captains. I will almost certainly never make a "1 GW transfer" ever again. I know it sounds harsh, but I may not buy Giroud ever again. I will almost certainly avoid taking a hit for GW19. 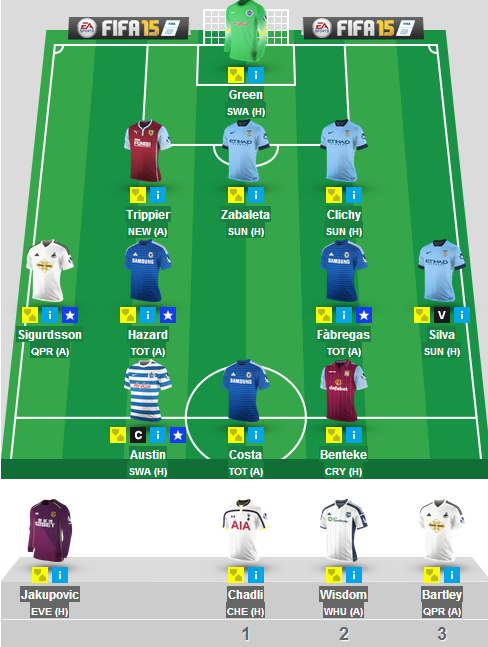 Aside from that, sorry if you copied any of my transfers and team selections from GW18. May it be a lesson learnt for all of us. We may be feeling down right now, but FPL is a game at the end of the day. These things happen. Remember, it's how you respond to the bad GWs that makes you a good FPL manager, not the good GWs. So, chin up, we have 2 GWs coming up in the space of less than a week! Why have I purchased Giroud and captained him? Giroud has scored the most FWD FPL points since GW16 (19). Giroud has scored a goal once every 51 minutes since GW 16. QPR have conceded 20 goals in 8 away PL games this season. Giroud has form on his side and likes scoring at the Emirates. Why did I buy Zabaleta? Joint 4th highest potency (ALI rating) of any defender this season. 10th best number of key passes of any defender this season. 10th best number of final third passes of any defender this season. 7/12 Fantasy returns since Gameweek 1, despite missing some games. Finally, Arsenal are averaging 2+ goals at home this season and need a win! Feel free to sign up and try to beat me this weekend! After Fletchers misfortune of hitting the post and team mates darn right greediness culminating in a 2 point disappointment of a week we search for someone ready to pick up the baton for the maverick and return us to the promised land of a few weeks ago. It’s only going to be a short Maverick today as the lure of another festive drink coupled with another mince pie and a blast on the latest Fifa far more occupy my mind (sorry guys and girls)! This week’s pick is Radamel Falcao. It’s unquestionably a punt as the Columbian struggles for minutes in his return from injury but with Wayne Rooney seemingly occupying a deeper role these days there could be an opportunity for the frontman to stake his claim. I haven’t deliberately picked the team facing Newcastle two weeks running on purpose, however the United strike force versus an inexperienced Jack Alnwick has weighed heavily in my mind. At 2.3% ownership and managers looking to offload Rooney maybe a sideways step is on the cards? There will be a lot of stayed up and down the UK and worldwide this festive period so if it’s ok for you why not your fantasy team? Please follow FanFeud & Fantasy5Live on Twitter!